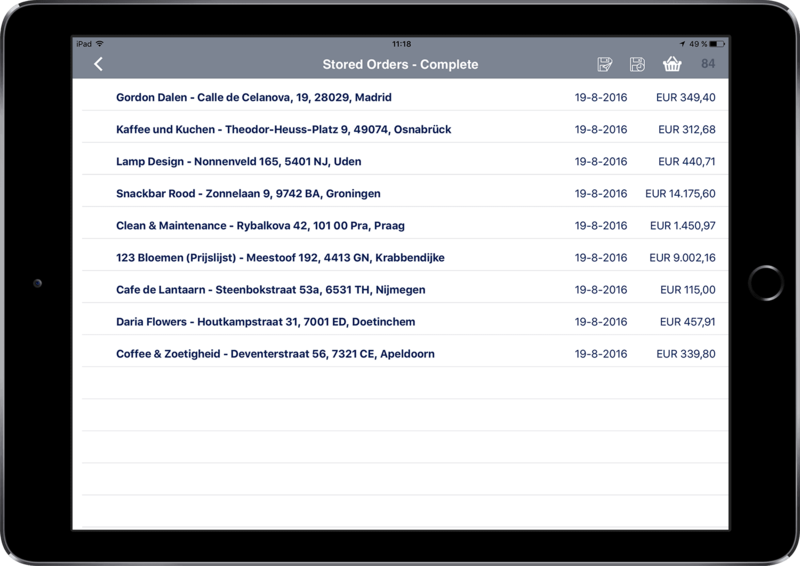 The order screen of App4Sales contains different features relating to the orders. This training explains these features step by step. In the order screen of App4Sales, it is possible to select a customer to create the order for, you can easily select the customer from the customer database. You can apply changes to already added items or add new items via the catalog. The order screen of the sales application supports the possibility to add items to the order using a scanner. Make sure the scanner is connected to your iPad to make use of this feature. In App4Sales, it is possible to apply customer-specific prices to selected customers. If you make use of, for example, quantity discounts, these will be applied to the items that have been added to the order, the discount will be displayed in the order screen. If there are price lists with foreign currencies present in the backoffice, these will be loaded in when customers from foreign countries are selected. The items and the order screen display the currency linked to the selected customer. Representatives can write their sale orders anywhere, regardless of what currency a customer has. When an order does not yet need to be sent, it can be saved from the order screen. The sales order can be saved as complete or incomplete and can later be opened via the main menu to be edited further. When the order of the customer is complete, it can be sent from the order screen. After pressing the send button, the order will appear in the backoffice in real-time. Thanks to this real-time connection with App4Sales, it is possible to process sale orders from customers more quickly and save time. If you are using the offline mode of App4Sales, the orders are saved. Once there is access to the Internet, the orders can still be sent to the backoffice from the overview of saved orders.